↑ Barry N. Taylor, Ed.. 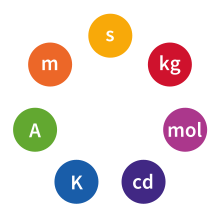 The International System of Units (SI). Gaithersburg, MD: National Institute of Standards and Technology. pp. 9. http://physics.nist.gov/Pubs/SP330/sp330.pdf. अन्तिम पहुँच मिति: 2007-10-30.